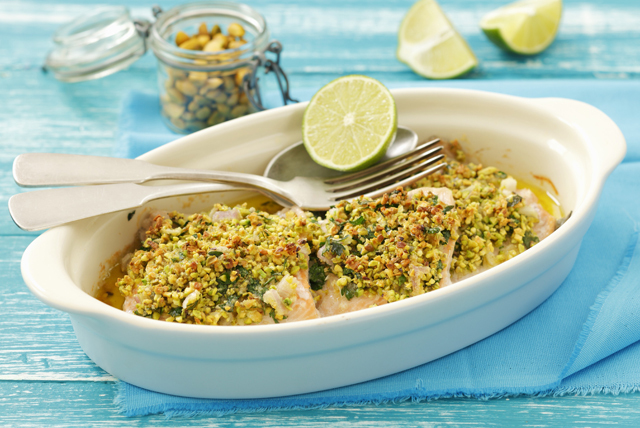 Looking for a simple, yet elegant, fish recipe? This flavour-packed cedar-planked salmon, featuring juicy grilled salmon fillets topped with toasted pistachios and served with a creamy dipping sauce, can come together in just minutes. Immerse plank in water, placing a weight on top of plank to keep it submerged. Soak at least 4 hours or overnight. Meanwhile, mix next 4 ingredients until blended. Refrigerate until ready to use. Heat barbecue to medium-low heat. Place fish, skin sides down, on plank. Remove 3 Tbsp. Miracle Whip mixture; spread onto fish. Top with nuts; press gently into Miracle Whip mixture to secure. Grill 18 to 20 min. or until fish flakes easily with fork. Serve with remaining Miracle Whip mixture. Substitute fresh basil or chives for the parsley. Prepare using fresh halibut fillets.